[Blind Gossip] The publicity stunt of 2019 is already being planned! Both people in this couple are famous but one has a more famous name. While some people like to keep the most important moments of their life private – and then announce the outcome more publicly – both of these two live for publicity. The private life event that they want to exploit? They are talking about having him propose to her at [public event] in front of a huge audience. Sigh. Some celebrities just love to make everything about themselves! The Kardashians love their publicity stunts! Moreover, the announcement was timed to take place just as The Golden Globe Awards broadcast was starting. The stunt backfired and annoyed people. But now you know that the Kardashians love publicity stunts that are timed to draw attention away from other events and to themselves. Now… on to the Superbowl! You may know that Travis Scott faced criticism from social justice warriors for agreeing to perform at the Superbowl in the first place. 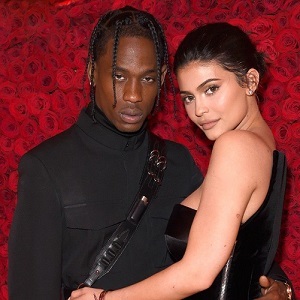 You also know that Kylie Jenner has been talking about getting engaged and wanting to have another baby with Travis Scott. So there were discussions as to how to combine these three factors – publicity stunt + social justice + marriage proposal – during Travis Scott’s Superbowl performance. The talks boiled down to taking a knee: If Travis Scott should do it during his Superbowl performance, when he should do it, and whether it should it be about more than one thing. Should Travis Scott take a knee to signal his alliance with Colin Kaepernick and social justice warriors fighting racial inequality? Should he take a knee and propose to Kylie Jenner? The latter would certainly generate a huge amount of publicity. We do NOT know what the final decision turned out to be. There were a lot of logistics being hashed out (e.g. Do they have to get permission from the show producers? Where would Kylie stand during his performance? Could the camera shots during Travis’ performance go back and forth between Travis and Kylie? Should Kylie be holding their daughter? ), but there was no proposal during rehearsal, so we don’t know if they are trying to keep it a secret or if the plan was simply scrapped. We’ll all find out very soon! Congratulations to Mountaingirl82 for being first with the correct response! Kylie Jenner was backstage with their daughter, Stormi, during the half time performance, but nobody on stage took a knee for any reason. I want a Kardashian-Jenner free everything! I dont like big obnoxious proposals but they are public celebrities,so its not surprising…. J Lo and the baseball guy. Kylie Kardashian Jenner and uhhhhh, that rapper guy whom she dates. Public Event: A rap concert? Optional: Tacky to the 4th power because everything is a cynical ploy to make money with the K family. Travis Scot and his Kardashian baby mama. Khloe? Jake Gyllenhaal and model Jeanne Cadieu — at the Spider Man premier. Jenny from the block and Arod…Times Square New Years…..It will be her 6th ring…..
Gag…it’s Travis Scott and Kylie Jenner, with him proposing at the Superbowl. Everyone knows, so if it happens this will be the most fake, most manufactured proposal since any one of Paris Hilton’s. They’ll get “engaged” for TV ratings, but a marriage will never happen, or if it does, will never last. Take your pick. Miley Cyrus and that liam. A Rod and J Lo at New Years Eve? Skip prior post… It’s Travis Scott proposing to Kylie Jenner at the Super Bowl halftime show. Not sure of the couple but I am sensing it may coincide with New Year’s Eve. Kyle and Travis during the SuperBowl halftime show? I really hope I’m not right. Drawing a blank on the couple but I’m betting on the Oscar’s for the event. The image reminds me of Taylor Swift. So logic from that would say that her ‘partner’ Joe Alwyn will propose. It will happen on her tour. Sweet or Tacky? Sweet if genuine. Just for a new story line on a failing tv show. Kylie Jenner and that Travis bloke. Is he doing super bowl? Couple: The Weeknd and Bella Hadid. The Super Bowl, of course! This isn’t the Superbowl, Travis Scott and Kylie Jenner is it? Hopefully not! Let me guess, since Travis Scott (Kylie Jenner’s baby daddy) is supposedly performing at the Super Bowl, that this is another stunt cooked up by the fame * family of Kardashian/Jenners…….GIVE IT A REST ALREADY, ENOUGH WITH EACH AND EVERYONE OF YOU!!!!!! Travis proposing to Kylie at Super Bowl during his half time performance??? Travis and Kylie at the Super Bowl. Ugh. Any proposal at a public event, or cliched place (top of the Eiffel Tower for one) is tacky. Travis Scott and Kylie during the Super Bowl. Super tacky. Gwen & Blake? At the Super Bowl or some awards show? Katherine Schwarzenegger and Chris Pratt. Hmmm….maybe the Super Bowl? A very wild guess!